A metal tray with lower lip attached to a V shaped pair of supports. Two flat perspex arms hold the pages open and are held in position by two large knobs. These knobs also allow height adjustment of the tray along the length of the supports. The second arm of the V placed horizontally on the table or bed provides the base support. Angled legs may be positioned to hold the book at an angle towards the user or away from. Has perspex page restrainers that are adjusted with large plastic knobs. Has reversible, height adjustable stainless steel legs which can be angled as required. Legs have protective plastic tips. 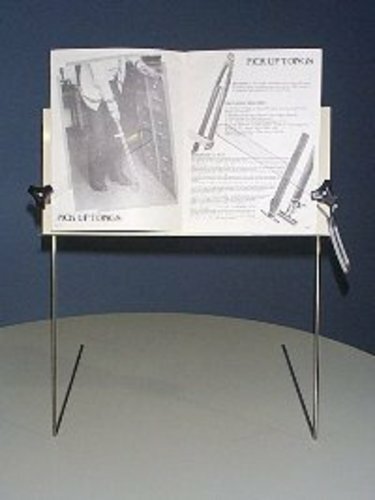 Model Multi-Purpose Reading Aid: An adjustable, portable bookrest where the frame may be used on a table top or in bed.